Out with the old…: You can rest assured that the only change at Atos has been the company brand name. 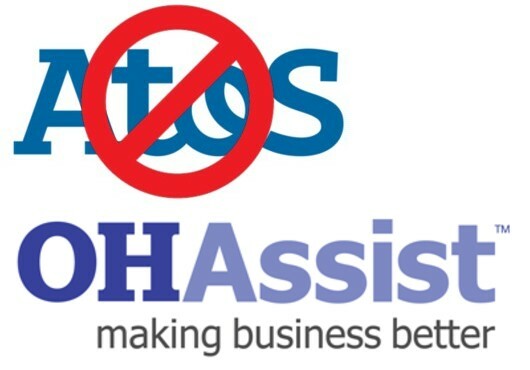 Does anybody else find it suspicious that, days after a nationwide protest against its abysmal – and often terminal – administration of the Work Capability Assessment, Atos has changed the name of its UK brand to OH Assist? The website is flashy and new but you can bet the service is just the same. Is this an attempt to bamboozle stupid old ESA and PIP claimants into thinking a new company is taking over where Atos left off, when in fact it is the same old mob, still raking in the profits from that lucrative, £100 million-per-year government contract? I think this is highly likely. We’ll await the DWP press release announcing the change (that is not a change) with interest. And not a little contempt. It also seems likely that Atos has re-branded with an eye on the government’s new ‘Health and Work Service’, offering to do occupational health work for another high-value contract. We’re not as stupid as you think.